Hollywood, CA. “Let’s Give the Band A Hand” was the title for the jazz celebration at Catalina Bar & Grill Sunday night. It was right on target. The program was the annual fund-raiser for the California Jazz Foundation. And the very worthy honoree was Catalina Popescu. Both the CJF and Catalina have been “giving the band a hand” for years. The celebration began late in the afternoon with cocktails on the outdoor patio and music by the Keith Jones Trio. At dinner time, everyone moved inside the club for an evening of feasting, opening with a performance of the youthful, but very promising players of “The Next Route” and climaxing with the Arturo Sandoval Big Band. 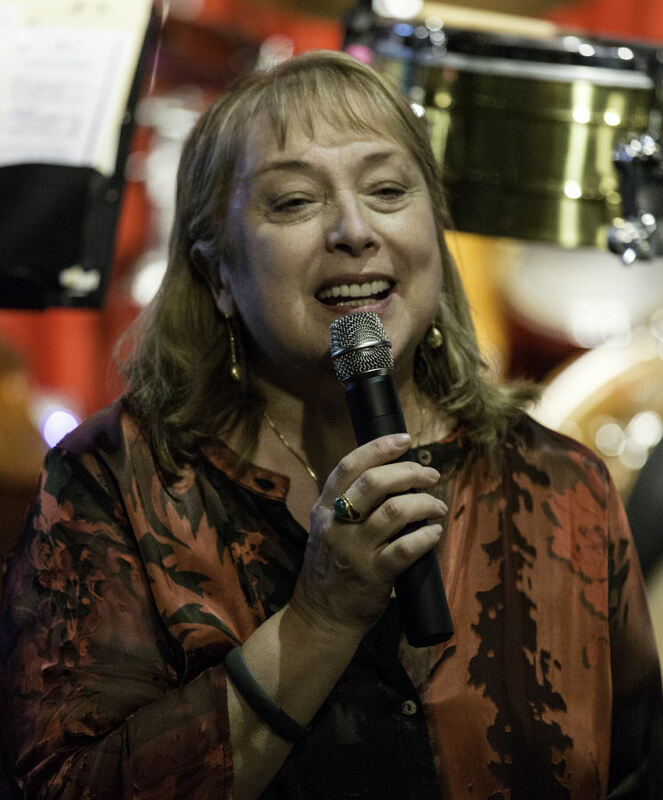 Before the music began, Catalina received her much deserved award from the CJF, there was a fund-raising auction and the brief acknowledgment of a few of the numerous jazz supporters and celebrities in the audience. But the musical high point of the event was the dynamic performance by Sandoval and the world class players in his Big Band. The program included a few selections from a Sandoval performance at Catalina’s last November. But both Sandoval and his players performed at such a high level that there was no sense of redundancy. As usual, Sandoval’s far-ranging virtuosity was on full display. His trumpet playing was extraordinary. 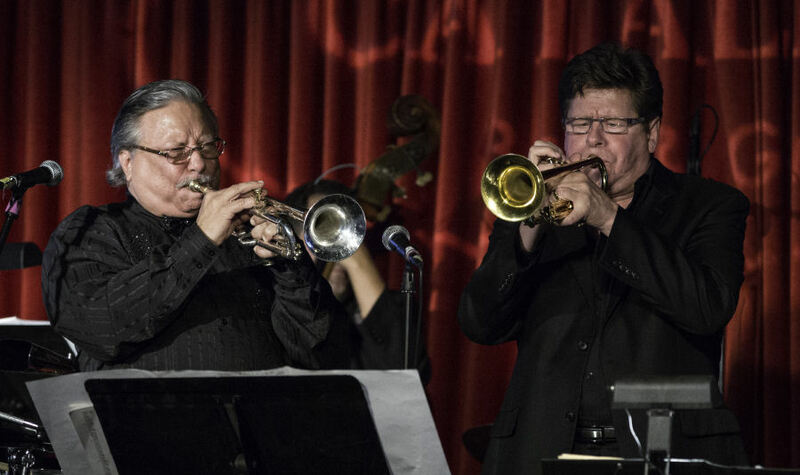 From a lush “Cherry Pink and Apple Blossom White” to an energetic and sometimes humorous duet on “And Then She Stopped” with trumpeter Gary Grant and another duet on “Waynard and Maynard,” originally written for Wayne Bergeron and Maynard Ferguson, here performed by Wayne and Arturo. He also sang, in convincing ballad style, his own tune, “Every Day I Think of You,” inspired by his mentor, Dizzy Gillespie, and backed by a warm undercurrent of fills from tenor saxophonist Bob Sheppard. On an untitled blues, Sandoval led the band through an improvised, on the spot arrangement, assembled spontaneously as he gestured to different soloists and sections, winding up with something resembling a Count Basie big band jam. For “All the Things You Are,” featuring solos from alto saxophonist Dan Higgins and trombonist Bob McChesney, Sandoval showcased his impressive piano chops. And in the closing fireworks of “Mambo Caliente,” he switched to timbales, displaying equally remarkable percussion skills. But, beyond the pleasures of the music and the award to Catalina Popescu, the important aspect of the evening was the fund-raising for the California Jazz Foundation and its dedicated efforts to keep food on the table and a roof over the heads of the many needy jazz players and singers. To learn more about the work of the California Jazz Foundation, click HERE.